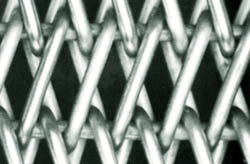 A modified variation of balance weave, using two inter-woven spirals. Two 12 pitch spirals are woven together to form a 24 pitch belt. Available in any material. Most commonly used in elevated temperature applications for Sintering, Brazing and Annealing.